Here's some photos from today's bash. Can anyone ID the flora/fauna? And can a more experienced photographer come along next time? 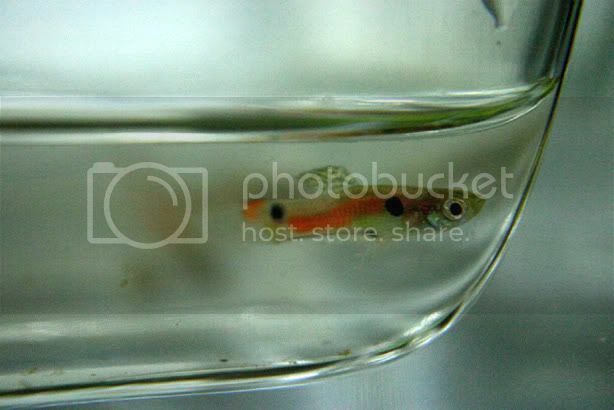 2) Also wild guppy, not Endler. I have such fellas, also caught from the drains. 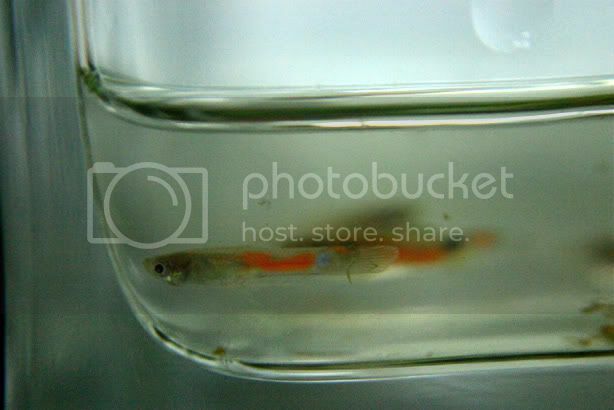 3) A young barb, looks like a checkered barb aka Puntius? oligolepis. Don't know the exact ID though. 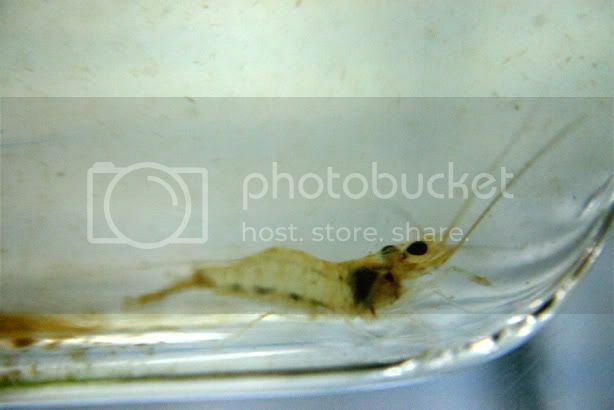 4) A small shrimp, maybe a Macrobrachium species. 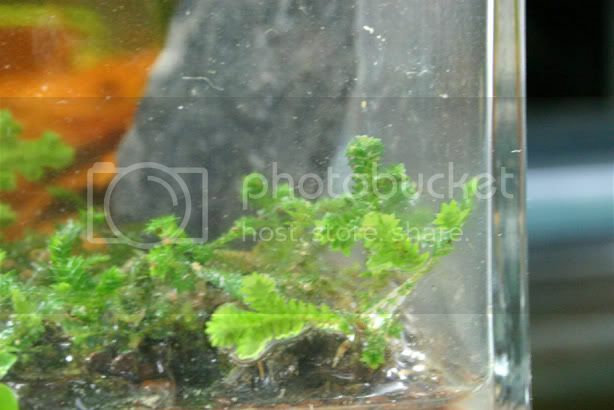 5) Some sort of terrestrial moss. Would moss have roots? The so called "hwchoy moss" does. Found it growing out of the riverbanks. Y'all should seriously consider coming along next time. so cool! As for the barb, the only species I spotted was the two spot barb. Which was nowhere near where I got this little fellah. 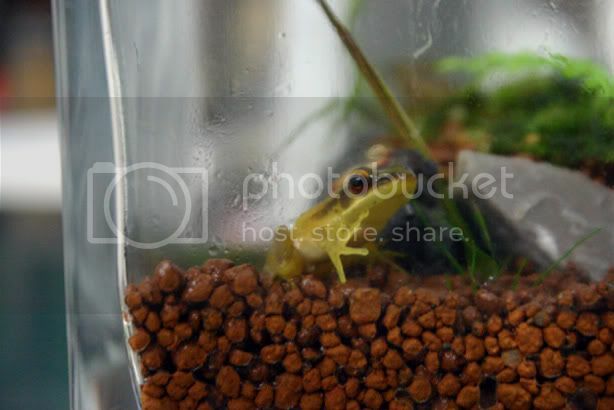 Either way, they're all in my daphnia tank with two 3cm pugnaxs(pugnaxi?) now. The adults in my 6ft are waay too agressive. Tried to eat the guppies as soon as they hit the water. More pics when they're older. 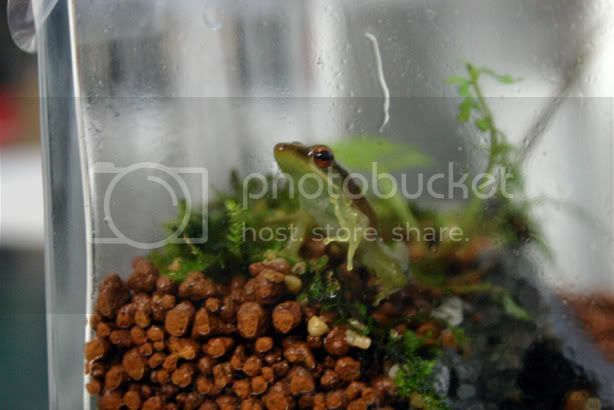 In the meantime: What is this frog? Last edited by benny; 19th Feb 2006 at 01:52. The "moss" in your pictures can be found at my housing area along the glass patch. I have not tried to grow it submersed but I think Teo's used to have it inside one of his tank accidentally. 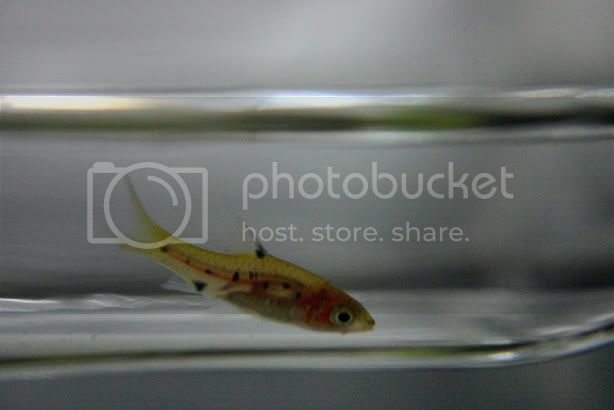 As for the guppy, I used to catch the similar ones when I was young. Quite common to be found along small drains, it is not necessarily to go into the canals for such catch. For those who wish to be safe, there is a drain along the main road by the 170 bus stop behind Chartered Semiconductor. You should be able to catch "longkan fish" there. It appears I was right! Those two guys are the, now un-common "common greenback"! Last edited by XnSdVd; 19th Feb 2006 at 02:02. That tank is waaaaaay too small for the greenbacks.. i hope its only temp??.. Edit: Think its some sort of selaginella..
Last edited by ranmasatome; 19th Feb 2006 at 04:13. It was quite a stupid day. Raining almost as soon as we stepped inside! And after that, a lot of wading in the mud. We went through plains of Crypts, some of which I can't ID. Could be natural hybrids. We shouted and waited but no one came. Saw this yr's newspapers so I think there should belong to someone. Maintained or abandoned? Pictures taken with HP camera, sorry for the poor quality. Maybe the old man was attending to something. Please be mindful of other's property. The last thing we need is to have folks accusing you guys as marauders, stealing when there is no one around. It's not as if any of those are unaffordable plants. Mostly cheap and common stuff. Well.. aside from me falling into one of his plots I don't think we did any damage. And technically, whoever it is, is squatting. Not exactly legal is it? It's probably not. However, stealing is wrong, it does not matter who from. Obviously they took efforts to do up the place. Well, we have yet to steal. And if I'm right about who the owner is, he did give permission... Shall have to ask the old man if we ever see him again. I'm not worried about you guys. We know you and weirong are members of good standing, especially have met you guys personally so many times. I'm just concerned about the misconceptions other folks might have of you since they are not in the know. No worrries. Keep us informed of your Singapore adventures! Don't worry Benny. 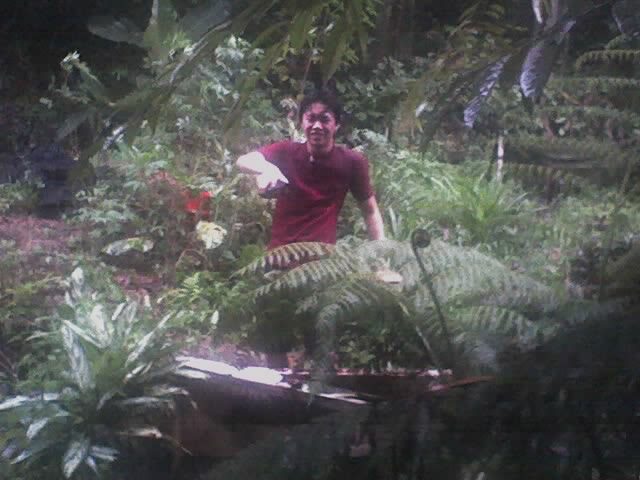 We didn't uproot all the plants. Like you mentioned, it's all quite common stuff. We know what we are doing. Just wondering what that place is used for, that's all. Btw, no Parker pen or whatever pen, and no camera lens. Want any zinc roofs instead? I know, that last post was for said members who're "not in the know"
You should come with us one day, I'm too busy splashing around like a happy boar and weirong's cameraphone doesn't exactly make a good replacement. NO PARKER PEN!!?? Looks like you guys have to go back. How can you miss it? It's freaking silver and bloody reflective in the sun! Definitely have to go back. Simon's close up filter also cannot find? Sigh......... You guys have stamps over your eyes right?